I enjoyed this post from the Content Marketing Institute’s website even though it is a few years old, because it speaks to definitive truth, that is truth which is well-defined and is still relevant today. 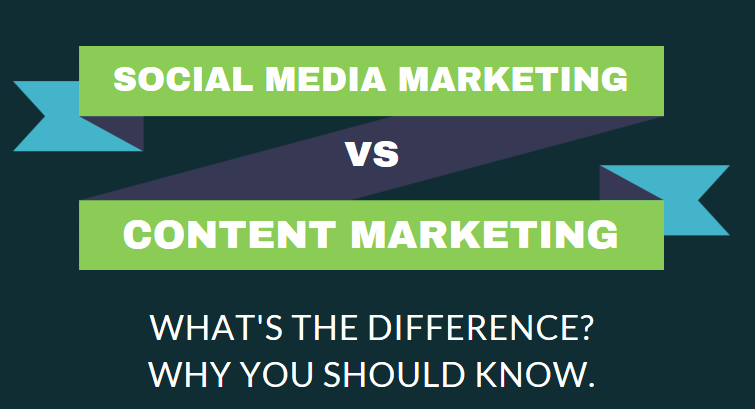 Many people think that social media marketing is the same as content marketing and that’s what Toby Murdock addresses in his article. If you take the trouble to read this fairly long piece, not only will your knowledge be sharpened, but you’ll understand why we focus on content marketing. Does your brand need some marketing? Contact us for a complimentary ‘Explore’ session! Indeed, content marketing heavily involves social media. And, of course, in social media, marketers use content to get their messages across. In social media marketing, the center of gravity — the focus of the marketing activity — is located within the social networks themselves. When marketers operate social media campaigns, they are operating inside of Facebook, inside of Twitter, inside of Google+, etc. As they produce content, they place it inside of these networks. In contrast, the center of gravity for content marketing is a brand website — whether it be a branded URL like AmericanExpress.com or a microsite for a brand’s specific product, like Amex’s Open Forum. Social networks are vital to the success of content marketing efforts, but here, Facebook, Twitter, and Google+ are used primarily as a distributor of links back to the content on the brand’s website — not as containers of the content itself. In social media marketing, content is built to fit the context of the chosen social platform: short messages in the 140 [now 280 since 2017 – Irene], characters range for Twitter; contests, quizzes, and games for Facebook, etc. Here, brands model their behavior after that of the individuals using the social networks. On the other hand, in content marketing, the context of websites permits much longer forms of content. Brands can publish blog posts, videos, infographics, and eBooks, just to name a few formats. Here, brands model their behavior after that of media publishers. While both social media marketing and content marketing can be used for a multitude of purposes, social media marketing generally tends to focus on two main objectives. First, it is used for brand awareness — generating activity and discussion around the brand. Secondly, it is used for customer retention/ satisfaction — brands can use social channels as an open forum for direct dialogues with customers, often around issues or questions that consumers have. In contrast, content marketing’s website-based center of gravity enables it to focus more on demand generation. As quality content brings prospects to a brand’s site, brands can develop a relationship with the prospects and nurture them towards a lead conversion or purchase. While I don’t know the ratio of brands that practise social media marketing compared to those that practice content marketing, I’d imagine it has to be somewhere around one thousand to one. Social media marketing is top-of-mind for most every marketing department, while content marketing is a (relatively) new term, and a new practice for many. Yet, I think of the two strategies less as two isolated options and more as interrelated parts of marketing’s ongoing evolution. The internet has unleashed a revolutionary ability for every brand to communicate directly with its customers — without the need for a media industry intermediary. Social media marketing is the natural first step in this process: Access to users is direct (users spend tons of time on social networks), and content is generally formatted into shorter chunks, which makes the publishing process relatively easy. But as brands become more familiar with their new role as publisher, the natural progression will be to move toward content marketing. Yes, the bar here is higher: In content marketing, brands must produce longer-form, higher-quality content and build audiences on their own site — they must become true media publishers. But the rewards and results are, arguably, more powerful. Brands can engage more deeply with their customers through content marketing efforts. And by driving consumers to its own website, the brand has a greater opportunity to gain leads and move them down the conversion funnel. As we all pioneer this new strategy of content marketing, a shared definition of what we do relative to approaches like social media marketing is invaluable. So now your turn: In the comments, feel free to discuss your thoughts. Is this a definition you would use to distinguish the two disciplines? What’s missing? Toby Murdock is co-founder and CEO of Kapost, which provides a content marketing platform that enables marketers to become publishers and win at the new game of marketing. Kapost customers include TripAdvisor, Mashable, Intel and Verizon. Toby lives in Boulder, Colorado with his wife and three daughters. Find him on Twitter @tobymurdock / @kapost.